The Share Our Strength team outdid themselves last week in convening the first national summit on rural childhood hunger. 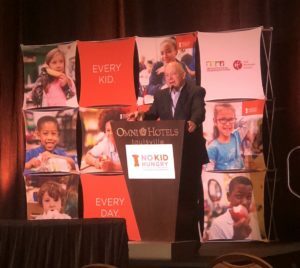 Led by our colleague Derrick Lambert, Share Our Strength’s No Kid Hungry campaign brought to Louisville, Kentucky leaders from 42 states to share data, experiences, and best practices regarding the special challenges of addressing childhood hunger in rural America. In opening the conference and welcoming the attendees, I shared what I believe to be three important truths about our work. The first truth is that childhood hunger is a solvable problem. Whether in urban or rural America. It may be the most solvable of all the problems facing our country. You don’t need a single fact or figure to know it. We are blessed with an abundance of food and bipartisan support for food assistance programs. What we have not had is the political will to ensure that every eligible child is connected to them. When we don’t solve it children get hurt. That’s obvious. But it’s not just kids who are hungry but yours and mine too. Because our schools suffer. Our health care system suffers. Our economy suffers. Americans are desperate for evidence that progress is possible and we have that evidence. We have added 3 million kids to school breakfast programs. So far we have protected SNAP and WIC. We know the ingredients it takes to succeed: expertise, advocacy, financial resources, best practices, collaboration, and persistence. We can bring these to bear in rural America as we have in cities across the country. When our food assistance programs are fully utilized, we get a glimpse of what is possible. Poverty, homelessness, unemployment were once guarantees of hunger. They are still a terrible burden. But they no longer have to be a determinant of hunger. Where kids are getting three meals a day, they have a chance. Second, we win or lose at the state level and local level. If your focus is on Washington, D.C. you will feel like nothing can get done. Recently we spent time with many of the nation’s governors at their annual meeting. They cooperate. They collaborate. Don’t assume partisanship cannot be overcome. Children are the most vulnerable and the least responsible for the situations they are in and I haven’t met a governor yet who doesn’t appreciate that. Our efforts knock down barriers between kids and the food they need, but governors can help scale those efforts. Third, is a harder truth, and another reason I feel such urgency about our collective commitment to rural America. We can’t solve childhood hunger by focusing on kids alone. These kids live in houses with adults and all of the terrible and toxic stresses that exist for parents in poverty. The sooner we reach our participation benchmarks for school meals and summer meals, the sooner we can find additional ways to support kids by making sure their parents and families have the economic stability they need. Two things are true at once– (a) we’ve made tremendous progress and have shown what’s possible; and (b) we’re not done yet and need help reaching all kids. Rural America needs us to succeed for reasons that go beyond only its children. I was recently with former Virginia Governor Terry McAuliffe who shared that as governor his primary focus was on economic growth and workforce development. He emphasized that the key to his success in attracting businesses to the state was the investments made in children and education that began with making sure every child was fed. I am grateful to all who attended the Rural Child Hunger Summit for knowing what their own hearts are for and for the small and large things they do every day to make this a country in which there is No Kid Hungry.